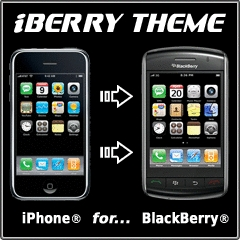 iBerry - iPhone BlackBerry Theme | BlackBerry Blast! This one of a kind iBerry theme is the most accurate iPhone theme for the BlackBerry on the market and is the ~NUMBER 1~ selling theme application on the internet in 2010! iBerry was designed to capture the visual appearance of the iPhone while still retaining that unique functionality of your BlackBerry. iBerry has been featured on all the major BlackBerry application websites, and it's creator, Lunars Edge Design, has received highest honor by the largest BlackBerry online app distributor, Mobihand, as "Outstanding Theme Developer." "This program has to be one of the best themes that you can buy.. I highly recommend it as in no way did the program slow down my phone... it looks great works great and i can organize just as if it was the blackberry theme... great iBerry application... will highly recommend" - Hector R.